The ’00s were a turbulent time for the comic-book business, as mainstream publishers like DC and Marvel suffered the sales declines affecting nearly all print-purveyors, while publishers of what used to be known as “alternative” comics saw some of their products hitting bestseller lists and turning up on the front page of The New York Times Book Review. Superheroes were more popular at the multiplex, but in terms of readership and buzz, the story of the decade was how a handful of high-profile non-genre books helped advance the medium’s standing in literary society. And there were other big stories over the past 10 years: the inroads made by online comics, the ascendancy of writers at “the big two,” the proliferation of outstanding archival collections of classic comics, and so on. Below, The A.V. Club’s regular Comics Panel team tries to touch on all the above, via our picks for the 25 best comics of the decade and the five best archival projects. These lists are presented alphabetically, and contain a mix of graphic novels, ongoing series, comic strips, and single issues. Limiting ourselves to 25 meant reluctantly leaving out a lot of our favorite titles (no Hernandez brothers, no Walking Dead, no Scott Pilgrim, no Astro City), so as always, we invite you to advocate for your absent favorites in the comments. This was the decade when webcomics tried to step up and prove they deserve a place alongside the great newspaper strips of the past, but Chris Onstad’s Achewood is one of the few that’s proven worthy of the challenge. Hiding some powerfully good storytelling behind simple art, Achewood quickly evolved from a reliably funny gag strip to a still funny but surprisingly deep character-driven comedy that’s stayed sharp no matter what bizarre direction it’s veered in. Ray and Roast Beef, the central funny-animal protagonists—human-like in their bad behavior, if nothing else—form the strip’s spine, and Onstad has found humor and meaning in their enjoyably quirky argot and exploration of the meaning of adult friendships. When he wants to go for more broad or surreal humor, he’s been able to draw on a bench of supporting characters as deep as any great sitcom’s. In 2000, Random House imprint Pantheon Books published Chris Ware’s Jimmy Corrigan, The Smartest Kid On Earth, bringing a story that Ware wrote and drew in the ’90s more critical attention and prestige than any comic book had seen since Art Spiegelman’s Maus. Since completing Jimmy Corrigan, Ware has been busy with the as-yet-uncompleted Rusty Brown and Building Stories novels, as well as with scattered strips in The New Yorker and elsewhere. Strictly speaking, the most influential and acclaimed comics creator of the ’00s doesn’t have a single completed work to hold up as one of the decade’s best. But Pantheon’s 2005 hardcover collection of Ware’s full-page strips, fake ads, and archaic bluster (sometimes referred to as The Acme Novelty Library Annual Report To Shareholders And Rainy Day Saturday Afternoon Fun Book) suits as both an intro to Ware and a representative sample of his ’00s work. Though about half the strips were drawn in the ’90s, Pantheon’s Acme Novelty Library has been packaged in such a way that it traces Ware’s evolution from the darkly humorous gags of “Rocket Sam” and “Big Tex” to the more poignant and despairing “Tales Of Tomorrow” and “Chalky White.” Between the jokes, Ware weaves in stunning formal experiments that attempt—through design alone—to map out the recurring cycles of life and art. Funny, sad, ingenious, and beautiful, Pantheon’s Acme Novelty Library provides ample evidence of Ware’s unique brilliance. Many of the best superhero comics of the ’00s spent time exploring what made us fall in love with superheroes in the first place. After the grimy, gritty, highly muscled ’90s, writers like Mark Waid, Geoff Johns, and others put a modern spin on the story-driven ’50s and ’60s Silver Age. Grant Morrison and Frank Quitely’s All-Star Superman takes the notion to an extreme, dropping the emotionally fragile Superman from the early-’60s stories of Jerry Siegel and Otto Binder into the body of a friendly god. Given a year to live in the first issue, Superman spends the rest of the series’ 12-issue run trying to set his life in order. In the process, Morrison puts a fresh spin on old Superman ideas—Bizarro, Jimmy Olsen’s monstrous transformations—and introduces some of his own, including a story in which Superman is secretly responsible for the world you’re living in right now. It’s enough to send even the most jaded comics fan outside to look up in the sky. Billed as “James Kochalka’s Collected Sketchbook Diaries,” the three volumes (and counting) of American Elf offer far more than the solipsistic scribbling of yet another autobiographical cartoonist. Limiting himself to a maximum of four panels per day of his life, Kochalka distills oceans of poignancy into tidy, even Zen-like teacups. Kochalka’s strips, as always, possess a deceptively innocuous virtuosity, and his prosaic yet dreamlike anecdotes about daily life, fatherhood, and videogames controlled by erect penises deserve multiple readings—not to mention recognition for making a seamless crossover between webcomic and graphic novel. Above all, though, American Elf is drop-dead funny, and Kochalka’s organic, semisweet humor skims self-deprecation without plunging into self-loathing. Few creators have followed a career arc as complicated as that of former superhero-book penciler turned European-style avant-gardist David Mazzucchelli. With the publication this year of his first solo graphic novel, Asterios Polyp, Mazzucchelli proved that it was worth the long wait for him to take possession of his own voice. The book follows a middle-aged architect whose fate seems governed by ancient urges and forces he can barely perceive. His story is rich and evocative, and made all the more astonishing by how carefully the art matches the plot: Mazzucchelli’s confident visuals illustrate every divergence and digression of the clever, funny narrative just so. Asterios Polyp represents one of the best-ever fusions of art and story, in a medium where such fusions are supposed to the very reason the medium exists. This book is the rare example of something that feels like an enduring classic the moment it appears. There’s a lot of darkness in Charles Burns’ Black Hole, and not just of the emotional kind, although there’s plenty of that, too. No, what’s striking about this graphic novel—which tells the story of a group of sexually active teenagers in 1970s Seattle who fall prey to a mutating STD known as “The Bug”—is how much ink is spread across the panels. Sometimes the blackness dominates the landscapes and throws characters into sharp focus; at other times, it merely lurks in the background, ominous and omnipresent. Burns wrote and drew Black Hole over the course of 10 years, and the end result is a work of haunting, nauseating loneliness, using “The Bug” as a metaphor for the transitional period between adolescence and adulthood, a time when the need for companionship is as strong as the inability to grasp it. The darkness, then, is inevitable. Plenty of indie comics explored alienation and despair in the 2000s, but few did so with Burns’ unflinching, unsparing compassion. Craig Thompson announced himself as a creator of note with his 1999 debut graphic novel, Good-Bye, Chunky Rice, a strange, poetic, but deeply felt and meticulously illustrated book about love, loss, and moving on. Then he disappeared for four years and re-emerged with a staggering sophomore effort that considerably upped the stakes: Blankets, an autobiographical, gorgeously lyrical book about first loves and religious obsessions. The story, about a young Christian man coming of age and struggling with an oppressive but comforting faith, delves into different forms of manufactured security, from relationships to religion; along the way, Thompson’s on-the-page avatar lets his imagination carry him out of his suffocating world of bullies and repression. Even more so than Good-Bye, Chunky Rice, this is a painful book, but it carries a sweetness that borders on profundity. It’s essentially Elliott Smith’s music in autobiographical-comic form. Alex Robinson’s terrific black-and-white series Box Office Poison was first published in single-issue form from 1996 to 2000, via indie Antarctic Press. But it gained a whole new level of awareness when Top Shelf published all 21 issues in a single mighty tome in 2001. And the graphic-novel version is a better format for such an intricately executed story, which develops a core cast of interrelated New York twentysomethings, but spirals off in all sorts of ambitious but microdetailed directions, turning bit players and background characters into real people with complicated backstories. Half the genius of Box Office Poison is that Robinson makes his New York a fantastically detailed, lived-in place; the other half is that he doesn’t take it painfully seriously. He periodically steps outside his narrative to pose questions directly to his characters, and to let their answers to random queries further characterize them. The results are rich and realistic, yet surprisingly puckish and just plain funny. Ed Brubaker is best known for his groundbreaking, wildly popular work with mainstream superheroes such as Daredevil, Batman, The X-Men, Iron Fist, and most infamously, Captain America. But he clearly put an extra shot of heart and soul into Criminal. The ongoing series, which debuted in 2006 (and won the Eisner Award for Best New Series the next year), updates hardboiled crime and noir tropes with jagged emotion, beautiful pacing, and a stark atmosphere that leaves plenty of room for gray—both graphically and morally. Like Sin City minus the steroids, Criminal proves that the decades-old genre of crime comics still has plenty of bang left in it. Frank Miller’s classic run on Daredevil in the 1980s has proven tough to follow, but for four years, writer Brian Michael Bendis and artist Alex Maleev (with some occasional assistance) delivered another string of all-time-great stories starring the long-suffering defender of Hell’s Kitchen. Bendis didn’t ignore Matt Murdock’s past, but his run on the series seldom depended on what had come before. He also found new ways to pull the ground out from under the hero, whether by forcing him to deal with being unmasked by the press, or making him cope with the unforeseen problems of winning a seemingly decisive battle with the Kingpin. With Maleev, Bendis indulged a taste for noir-inspired urban dramas and drew in a lot of viable second-stringers—Luke Cage, Bendis’ own Jessica Jones—to fill out the supporting cast for stories that made superheroics again feel at home in back rooms and rain-soaked alleys, where none but the brave and the wicked dare set foot. With The New Frontier, writer-artist Darwyn Cooke returned the heroes of DC’s Silver Age into the jet-age Cold War era that forged them, and charged them with saving the world while figuring out what it means to be heroes in a time of tremendous change. While acknowledging the real-world historical problems that the comics of the era happily ignored, Cooke’s series works like an anti-Watchmen, reassembling the superhero mythologies Alan Moore spent much of the ’80s picking apart. (That’s no slant against Moore, whose America’s Best Comics line engaged in a similar project.) It’s a smartly written series and an even better looking one, thanks to Cooke’s clean, animation-inspired art, which makes characters like Wonder Woman and Green Lantern look classically iconic, yet startlingly new. Cartoonist Daniel Clowes spent much of the ’00s working on screenplays and the occasional short strip for national magazines (amid a prolonged health crisis), so he only had time to deliver two lengthy comics: “Ice Haven” and “The Death Ray,” which appeared in Eightball #22 and #23, respectively. Both are broken up into one- or two-page chapters, drawn in a range of styles from simple cartoons to naturalistic sketches to full-scale, dynamic action layouts. But while both stories are excellent, “The Death Ray” is a straight-up masterpiece, using comic-book staples like superpowers, teen angst, and fight scenes to comment on how the petty grudges of young adulthood resolve into a system of values, subtly guiding the way the world is run. The story follows Andy, a tense, middle-aged loner who recalls his high-school years in the late ’70s, when he took up smoking and acquired superhuman strength, along with a death ray capable of disintegrating its targets. “The Death Ray” could be read as a critique of American foreign policy, or a kiss-off to superheroes, or just another of Clowes’ keen dissections of teen ennui, with the details of a young man’s first cigarette and his first punk-rock album serving as more than just coming-of-age signifiers. Buoyed by the success of Persepolis (see below), Houghton Mifflin took a chance on another autobiographical graphic novel by a female artist. Alison Bechdel honed her chops for more than two decades on the wonderful strip Dykes To Watch Out For, but Fun Home—her amusing, difficult account of childhood and her relationship with her academic father—was a massive leap forward. The art is far and away the best Bechdel has ever done, with her usually strong, simple, expressive ink lines bolstered by successful use of color wash and framing. Incredibly detailed, intricate, and allusive, Fun Home puts its intellectual and densely referential tone to work in a story saturated with real human drama, such that it never seems affected or dry. Unsurprisingly, the book was a critical success; more unusually, it became a bestseller, helping discredit the belief that there’s no audience for sophisticated comics storytelling in America. Of all the alternative cartoonists who broke through in the ’90s, few were as productive in the ’00s as Seth. Though production on his regular series Palookaville slowed to a crawl (hampering the long-gestating graphic novel Clyde Fans), he’s been active designing archival collections, doing commercial illustration, and knocking out short graphic novels in his sketchbook. This year’s George Sprott, 1894-1975 is sort of an amalgam of Seth’s work this decade; it’s an oversized, hardbound graphic novella that expands on a series of serialized one-pagers Seth drew for The New York Times Magazine, all about the last days of an arctic adventurer turned TV host. Some of the book looks simple and sketchy, other parts look far more detailed, and the book as a whole is handsomely designed. More importantly, George Sprott continues Seth’s career-long obsession with constructing worlds for readers to get lost in, built from fictional places and characters that feel realer than real. James Sturm has quietly become one of the most reliably excellent comics artists in the country. His period pieces are crammed with historical detail and powerful dramatic scenes, though the best of them is the one with the oddest premise: The Golem’s Mighty Swing, about a barnstorming 1920s Jewish baseball team that tempts fate by engaging in a seemingly absurd promotional gimmick. Sturm lets the tension mount and mount, portraying the personal stories of compelling individuals against a bigger backdrop of racial prejudice and class issues. With his focused depiction of motion and his keen eye for detail and expression, Sturm creates one of the most thrilling sports stories in American comics history. The Golem’s Mighty Swing features a somewhat bewildering coda, but every other page delivers a reading experience as deep as the comics experience can get. 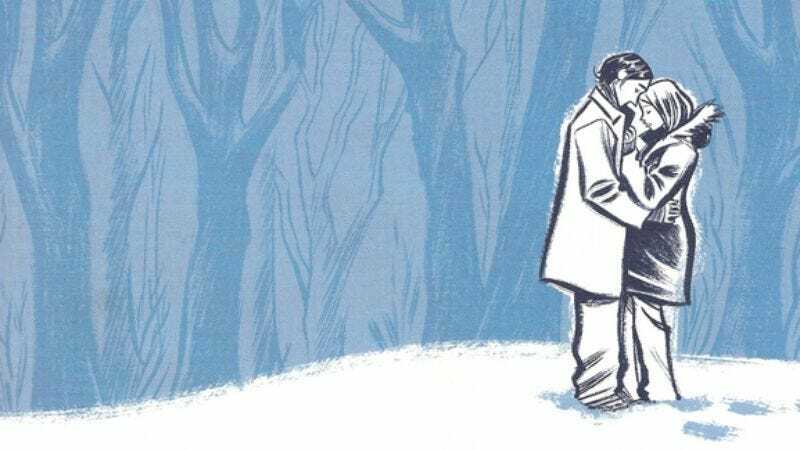 With a body of work that spans detached autobiography, biblical interpretation, and sheer, nightmarish absurdism, Chester Brown has never failed to surprise. In 1999, his delicate yet substantial artwork and epic sense of space were brought to bear on the least expected of subjects: Louis Riel, the 19th-century Canadian resistance leader and folk hero. Collected in 2003, Louis Riel: A Comic-Strip Biography showed just how far journalism can stray into subjectivity, even when the biographer himself can’t seem to decide how he feels about his subject. Brown made his name as one of underground comics’ daring, endearing weirdoes, but Louis Riel is his most culturally relevant work to date, in spite of its edge of unsettling surrealism. Roughly once a year throughout the ’00s, Rick Geary delivered another of his carefully researched, beautifully drawn “Treasury Of Victorian Murder” books (or lately, “Treasury Of XXth-Century Murder”). All are essential reading for comics fans and history buffs alike, but The Mystery Of Mary Rogers is especially fine, turning the real-life case that inspired Edgar Allen Poe’s “The Mystery Of Marie Roget” into a thoughtful meditation on the origins of stories. Geary’s style—which combines portrait-style illustrations, detailed graphs, and deadpan narration—suits the tale of a woman whose body washed ashore in New Jersey in 1841, sparking rampant, lurid press speculation about whether she was raped and murdered, or whether she was the victim of a botched abortion, or whether something even more appalling happened to her. Geary portrays the culture of New York in the mid-19th century as a hybrid of European sophistication and frontier barbarism, and as he muses on how a case can scandalize a community yet remain an utter mystery, he shows how fiction is born from our unceasing fascination with the lurid. Dubbed “autobifictionalography” by cartoonist Lynda Barry, the book One Hundred Demons takes an art-school exercise (“paint your demon”) as the jumping-off point for 17 stories about growing up as the funny-looking, lower-middle-class daughter of an abusive Filipino mother and an absentee father. As always with Barry, the art in One Hundred Demons is minimal but rarely cutesy, the dialogue pinpoints the inarticulate but meaningful grunts of children, and the captions vividly recall the minutiae of the past, from the sensations of falling out with a close friend to the textures and smells of a discarded toy. But Barry also makes a real leap forward with One Hundred Demons, incorporating some of her philosophies of creativity into a book that combines found objects, obsessive filigree, and unflinching examination of past failures. One of the most unlikely comics success stories of the decade was the warm reception given to a pair of graphic novels about a young girl growing up in post-revolutionary Iran. Persepolis made Marjane Satrapi’s reputation as an artist to watch, and spawned an acclaimed animated adaptation. Some critics have taken the book to task for Satrapi’s self-flattering depiction of her own experiences, and for its negative views of Iranian religious society, but close reading reveals Persepolis to be a painfully honest, warts-and-all portrayal of its author, who owns her occasional bouts of egotistical selfishness and prejudicial thinking as much as she does the more positive aspects of her character. From her holy-terror childhood to her haltingly rebellious adolescence to her deeply troubled college years, Satrapi portrays herself as a complex figure, neither pure nor damned. This deep self-evaluation, along with the lovely art (which owes more than a little debt to Charles Schultz), is what makes Persepolis a classic. Comics fans learned a long time ago not to count out Alan Moore, so it’s no surprise that the man considered by many to be the greatest writer in the history of the medium was responsible for an ongoing comics series of exceptional quality this decade. What is surprising is how the series developed. Originally intended as Moore’s sophisticated riff on Wonder Woman, Promethea was an exceptional superhero comic from the start, but Moore grew bored with it. So rather than continuing to crank out stories in a more-or-less traditional format—or abandoning the book altogether—Moore decided to turn Promethea into a freewheeling exegesis on magic, philosophy, transcendental spirituality, and the nature of fiction. Moore’s scripts grew ever more discursive, and artist J.H. Williams III shadowed him every step of the way, providing innovative, experimental visuals that helped turn the stories into something much more symbolic and meaningful than some didactic lecture on mysticism. Like the best of Moore’s work, Promethea began somewhere familiar, and landed somewhere far stranger. Joe Sacco pioneered comics-as-journalism with books like Palestine and Safe Area Gorazde. Quebec’s Guy Delisle carried on the tradition in the ’00s with Shenzen and Pyongyang, the latter of which chronicles the time he spent working for a low-budget animation studio in North Korea. It’s simultaneously funny, chilling, and enlightening, providing a rare, detailed look at life behind the last Iron Curtain and its forbidding capital: the closest thing to a real dystopia anyone could hope to find on Earth. Alt-comics publishers used to pump out cheap magazines filled with off-color jokes and offbeat short stories, but in the ’00s, with the single-issue market drying up, only a few cartoonists have upheld the tradition of underground comics as a bastion for the quick-and-dirty. Johnny Ryan was one, with his eye-poppingly scatological Angry Youth Comix. And for those who prefer slightly more elevated absurdity, Michael Kupperman’s Tales Designed To Thrizzle has offered twisted homages to kiddie comics and clip-art, recombined into strips that make the whole medium seem inherently silly. No one does giddy surrealism quite like Kupperman, who hops happily from stories about Mark Twain and Albert Einstein as rogue cops to tales of Sam Spread: Sandwich Spread-Obsessed Detective, all between bizarre prose pieces and fake ads (“Gay Yokels: Fine dining for the hillbilly homosexual!”) Tales Designed To Thrizzle is like Acme Novelty Library for those who which Chris Ware would be less fussy and more funny. John Arne Sæterøy—the Norwegian cartoonist known around the world as “Jason”—has developed a unique style over the past 10 years, combining the visual simplicity of the Eurocomics tradition with the pop-culture obsessiveness of an American, all wrapped up in a blackly comic deadpan. Why Are You Doing This? marked Jason’s first attempt at a full-color graphic novella, and it’s quintessentially Jason both in its story—a Hitchcockian “wrong man” thriller about a lovesick slacker framed for the murder of his best friend—and in its style, which alternates taut action sequences and idle scenes of nothingness. Typically for a Jason book, Why Are You Doing This? builds to a gut-punch ending that attempts to answer the titular question. Why do people fall in love, chase each other, kill each other? Because this is a story, and stories need to be interesting. Over six years and 60 issues, Brian K. Vaughan and, for the bulk of the run, artist and co-creator Pia Guerra used the idea of a world without men—almost—to examine society and humanity. His high-concept plot saw a killer plague eradicating every male human and animal on Earth except two: a callow would-be escape artist named Yorick Brown, and the capuchin monkey he’s training as a helper animal. As the series progressed, Yorick and various associates travelled across the States and to other countries, observing how the loss of men changes societies—or in some regrettable cases, doesn’t really change them much at all. While the series occasionally got repetitive and episodic, particularly as various organizations vied for ownership of Yorick and his monkey, its single long plot arc rarely failed to be gripping, and in its well-considered speculative look at which parts of culture are caught up in gender and which are just basic humanity, it was detailed enough to stand as political and social commentary rather than just a meandering adventure. Neophytes should be warned that readers were never given one definitive answer for what caused the plague—instead, the series as a whole offers a number of explanations, and leaves fans to decide which is most plausible. That freewheeling attitude toward conclusive answers may explain how Vaughan wound up as one of the head writers of Lost. The advantage to having all 55 issues of Bone collected in one edition isn’t just a reduction in storage space. Jeff Smith’s magnum opus reads more like a novel than a comic, and Bone: One Volume Edition is the story’s ideal state: a huge, afternoon-killing volume that will dominate any bookshelf it calls home. Bone starts small, with the three Bone cousins, Fone, Phoncible, and Smiley, exiled from Boneville and uncertain about their future. Things get considerably more complicated from there, as the three leads face off against rat creatures and the Lord of Locusts, and get entangled in the lives of humans living in a nearby valley. Smith’s plotting sticks to basic fantasy tropes, but his careful attention to character is what makes the book work so well. The Bone family, inspired by Walt Kelly’s Pogo, are well-realized and endearing, and Smith’s art captures each mood and sight-gag perfectly, with a cartoony style that carries a surprising emotional weight. It’s a grand tale well told, presented in the best possible way. Specialty publishers like Fantagraphics and Kitchen Sink had released scholarly collections of vintage comic strips before, but when Fantagraphics got the rights to reprint the most popular comic strip of all time, the success of the books cleared the way for more classics of American popular art to receive the prestige treatment they deserve. From the tidy Seth-designed covers to the introductions and indices (as in “Charlie Brown, insults to, re: size & shape of head”), The Complete Peanuts has framed Charles Schulz’s enduring masterpiece about as well any lifelong fan could’ve hoped. EC’s masterful, trailblazing comics of the ’50s and ’60s have been reprinted in myriad incarnations over the years—including disappointing hardcovers and cheaply produced (though economically accessible) newsprint. But in 2006, Gemstone finally started giving the EC catalogue its due: The EC Archives, while fairly pricey, is worth every penny, featuring gorgeously colored hardcover restorations of the imprint’s legendary and controversial crime, war, horror, and science-fiction tales. From Weird Science to Tales From The Crypt, the series is a fitting showcase for the highly influential—and still gripping—work by some of the comics medium’s greatest creators, including Wally Wood, Frank Frazetta, Harvey Kurtzman, Al Feldstein, and EC’s mastermind himself, William Gaines. George Herriman’s Krazy Kat is easy to describe but almost impossible to explain. It was a comic strip published in newspapers for three decades (starting in 1913), with a simple premise: Krazy Kat loves Ingatz the mouse, who doesn’t like Krazy much, and shows his irritation by throwing bricks at the poor infatuated feline. Officer Pup loves Krazy, and he expresses his love by trying to prevent Ignatz from brick-throwing, but Krazy interprets Ignatz’s abuse as a sign of affection, and is constantly undermining Pup’s efforts. Herriman uses this triangle of perpetually thwarted desires as a framework for an endless series of puns, philosophical gags, and slapstick, set against the starkly surreal Coconino County. The strip is influential (Calvin And Hobbes’ Bill Watterson is a big fan, for one), but had been difficult to find until Fantagraphics set about continuing Eclipse Comics’ defunct reprint series. The Krazy & Ignatz books have been a godsend to comics fans, with each volume repackaging two years’ worth of Sunday strips in attractive, Chris Ware-designed softcovers. Each book is bizarre, sweetly amusing, and blissfully continuity-free. It’s hard to decide which post-Complete Peanuts comic-strip-reprint project has been the most revelatory, but a strong case could be made for Drawn & Quarterly’s Walt & Skeezix books, which have gone back to the early days of Gasoline Alley (starting with the arrival of the foundling Skeezix in 1921) and have showcased the gentle humor, graphic mastery, and deep human insight of the strip’s creator, Frank King. The daily strips collected in Walt & Skeezix tend toward the subtle, while the 200 full-page Gasoline Alley Sunday strips in Sundays With Walt & Skeezix are more astonishing in their artistry and imagination. By the mid-’20s, King had begun to experiment with his art, working with silhouettes, shadows, close-ups, and even some light surrealism. In the Sunday strips—especially in the weeks when Walt and his young ward took a long walk or a drive in the country—King used the limited color palette of the comics page to render the outside world as though it existed in a perpetual state of autumnal twilight. For Sundays With Walt & Skeezix, Sunday Press employed the regular Walt & Skeezix design team of Chris Ware and Jeet Heer to package an assortment of King’s best Sundays into a handsome 16” by 21” hardcover. The book makes a nice companion piece to Ware’s own oversized book collections Quimby The Mouse and Acme Novelty Library, showing a little of Ware’s inspiration for pages that practically engulf readers in their precise, heartrending detail.